Soon after the news surfaced that a pregnant scientist was booted from a conference lineup, a new hashtag was born: #7monthsawesome. Seven months is how far along Samantha Decombel is in her pregnancy. The European Commission deemed her health -- meaning the state of her pregnancy -- a travel risk, so Decombel was uninvited to a November conference. Another geneticist, Karen James, came across Decombel's story through social media. James, who said she doesn't have kids but has experienced "plenty" of sexism in her industry, proposed creating a hashtag to support Decombel. 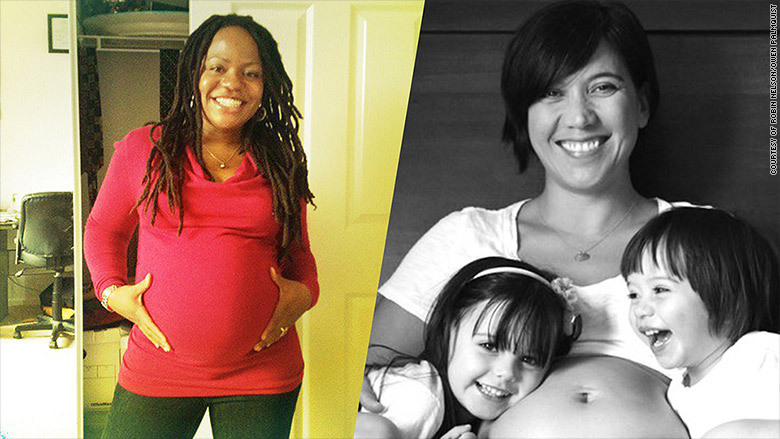 That way, women can show solidarity -- and create awareness about pregnancy discrimination. Just like naming a baby, James struggled to settle on the right hashtag. Another Twitter user recommended #7monthsawesome. Since then, the tweets and photos of pregnant women doing pretty amazing things during the late stage of their pregnancies have been rolling in. Shout out to all those mums to be who were/are on bedrest or otherwise couldn't climb mountains/teach Zumba. You, too, are #7monthsawesome! Even the European Commission used the hashtag, tweeting "@samdecombel apologies again. Something went wrong down the line for which we assume collective responsibility. We are sorry #7monthsawesome"
For her part, Decombel says she's been "overwhelmed" by the way women have come together to turn the issue into a positive campaign. "So many awesome mums rocking pregnancy out there!" she told CNNMoney, adding that it's frustrating to have to remind people that pregnancy is normal. "This issue was all about choice, and women having the right to do what they know is best for them," she said.